We have reached the Sweet 16 stage of our Halloween Candy Madness. 16 candies remain of the original 64. Which candies will continue on? 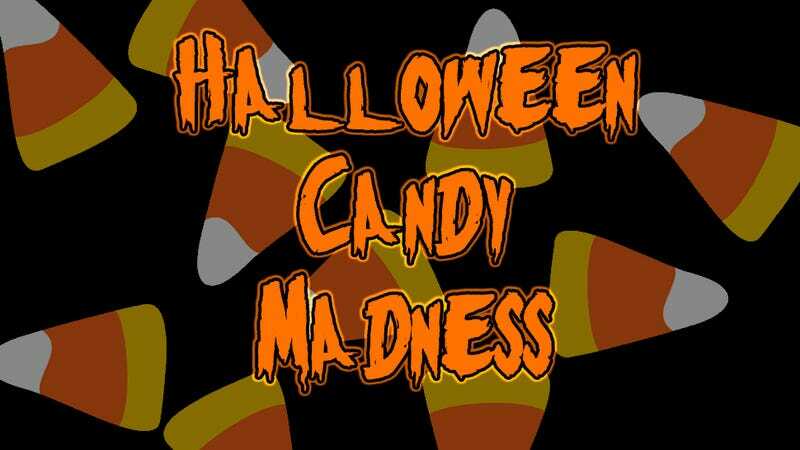 And which candies will be discarded to be discovered later in the seat cushions of your couch? Let’s vote and find out. Here we are once again. That last round was a bit of a doozy in some of the match-ups. Close fights were rare, but they did exist, and boy were some of them close. Sweetarts fell to Hershey Bars by 7. And Nerds held off Whatchamacallits by a mere 3 votes! Butterfinger and Skittles were neck and neck till the end, before the Simpsons’ favorite pulled ahead. But all of that is old history now. This time around the choices get tougher. It’s all big name brand candies facing off against each other. Snickers is a heavy favorite, but it faces Milky Way so this may be the round it falls. Both M&Ms face Hershey and Krackel respectively. The annoyingly plucky Junior Mints faces its toughest fight yet against the Reeces Peanut Butter Cups. And the rest are equally tough choices. And that it for this round. Hope we’re all still enjoying ourselves. Happy voting, and don’t eat too many candies.